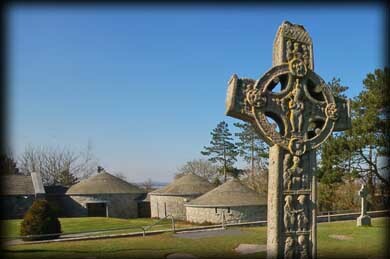 The Monastery at Clonmacnoise, Co Offaly, was founded in the 6th century by St Ciaran, one of the Twelve Apostles of Ireland who studied under St. Finian at the famous Clonard Abbey. 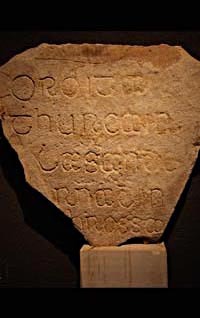 The strategic location of the monastery at a crossroads between the major east-west land route through the bogs of central Ireland and the River Shannon, helped it become a major centre of religion, learning, craftsmanship and trade by the 9th century. Many famous manuscripts were written here, including the Book of Dun Cow written in the 12th century. 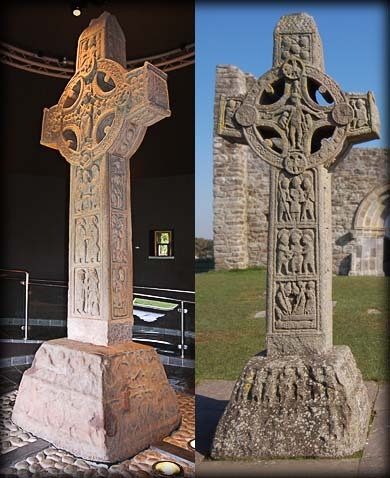 Amongst the many remains at Clonmacnois are two complete High Crosses plus the shaft of another. The most famous, the Cross of the Scriptures, also known as King Flann's Cross, is the centre-piece of the new interpretive centre. The crosses were moved from their original positions in 1991 into the new centre and superb replicas were placed outside in the original positions. Pictured right is the west face of the Cross of the Scriptures. Shown from the bottom panel up: Soldiers guarding the tomb of Christ, the arrest of Christ, Flagellation and in the centre of the ring the Crucifixion. This cross is decorated with figure sculpture on all four sides. The Cross of the Scriptures was mentioned twice in the annals of the Four Masters, first in 957 and later in 1060. At the centre of the head on East face is the Last Judgement, and at the top of the East shaft is a panel showing Christ with Peter and Paul. Below this panel are two more panels bearing iconography that are still open to interpretation. On the base are three riders facing left and two chariots facing right. 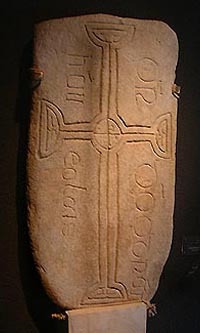 At the bottom of the shaft is an inscription that has now become almost impossible to see: OR DO COLMAN DORRO .....CROSSA AR RIG FL.ND, A prayer for Colman who had the cross erected on King Flann. 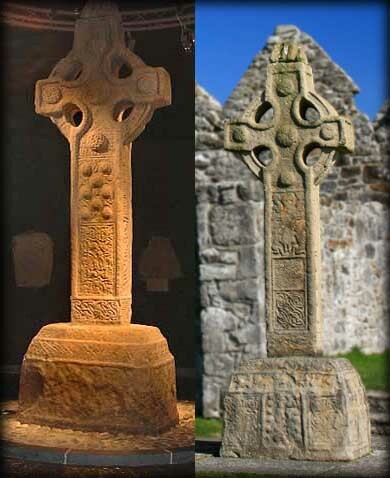 Cross of the Scriptures, original on the left. 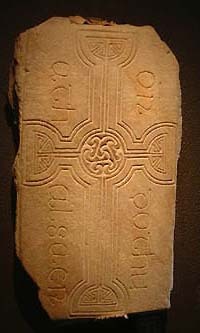 The South cross is very similar to the Ahenny ornamental crosses and the stone crosses on Iona in Scotland, in that it too is a skeuomorphic representation of a wooden cross. The raised bosses represent the studs that would have kept the wooden crosses together, with the hatched moulding along the edges representing the metal plates encasing the wood. The Cross bears a crucifixion scene on the west side of the shaft, which is believed to mark a transition to the scriptural crosses. On the eastern side of the shaft is a panel with a vine and birds. The triple-stepped base of the cross represents the Rock of Golgotha and bears quite a of worn carvings. The southern side has iconography in the left hand panel showing the Fall of Man. Although the western side of the base is very worn , you can make out a procession of horsemen. 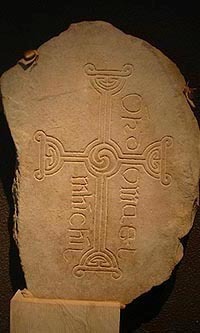 Pictured right is the North Cross which it has been suggested is the oldest of the crosses at Clonmacnoise.. The west face is covered with interlacing. The South face bears a cross legged figure in the second panel from the bottom, pictured far right, and lion in the top panel. 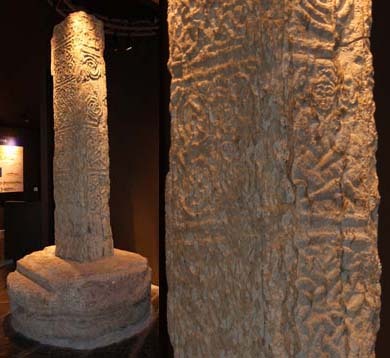 There are a large number of cross slabs on display in the visitor centre a few of which are shown below. Situated: In County Offaly, On theEastern banks of the river Shannon 11.5 kilometres South of Athlone. Discovery OS. Map: 47 N 008 306. Last Visit: Mar 2011.